Years ago I wrote a column for Reader’s Digest recounting my experience as “Jackhammer Man!,” when I rented a jackhammer to dig out some concrete around our home in Roanoke, Virginia. As a little kid in my home town of Clinton, Iowa, I had watched a bunch of jackhammer men tear up the street in front of our house. They struck me as the ultimate in manhood and I always wanted to see what it was like to run a jackhammer. So I got my wish that summer day in Virginia. It took me about a week before my hands worked normally again. Now I have taken on a new role – “Deckwrecker Man!” In preparation for an addition being added on to the back of the Carenen Cottage, our extensive rear deck needed to be removed. I volunteered to do it to save money. A knowledgeable friend helped out with several tools unique to the task. The most prominent was five feet long with two prongs at the end, the width between them perfect for accommodating a joist. The idea was to insert the prongs under the deck planks and, with the base situated on the joist, leverage the planks up so they could be removed. The tool was called a “Deckwrecker,” and it worked, along with other, smaller tools that, altogether, reminded me of my dentist. It wasn’t fast work, but it was steady, especially after I bought a 4-pound sledge hammer to assist in removing certain stubborn pieces not suitable for the Deckwrecker. Anyway, I got all the planks off last week despite losing time due to rain. Starting today, I’m going after the multiple 2×8 joists and other underpinnings. Problem is, there is no special tool, outside of explosives, to remove those significant elements. I also lack a strategy for taking on the big pieces. Maybe I’ll call my dentist. Stay tuned. This entry was posted in Tales from the Carenen Cottage and tagged deck, Deckwrecker, dentist, handy man, home improvement, Jackhammer, Reader's Digest, Roanoke, Virginia. Bookmark the permalink. Good luck with the rest of the demolition. What a neat tool! 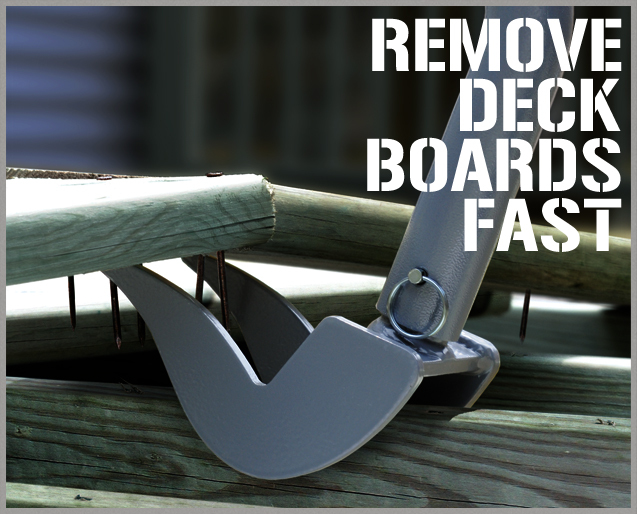 We know who to call when it’s our turn to remove our deck, eh?? . . . and I remember “Jackhammer Man” – I laughed so hard!!! There is a “special tool”, it’s called a sawzall or reciprocating saw. You get a big one (corded) and put giant nail eating blades in the end. Some of those blades are a foot long! You’d really like it.